Are you looking for live music for your wedding? Perhaps you’re searching for wedding hymns, processional ceremony music or entertainment for your guests pre wedding breakfast? We can provide a range of band sizes to meet your needs. Being nearly 130 years old we have an extensive library of music for you to choose from and can look to order special new pieces should we not have them. Brass is fantastic for variety. 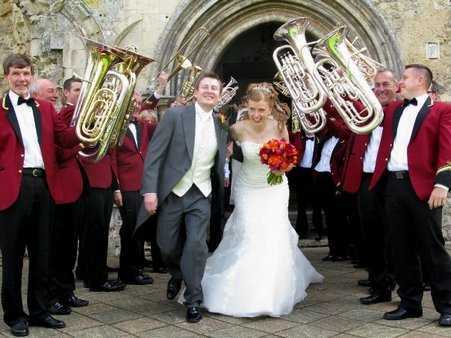 We can adapt to your wedding theme whether you like classical, big band, film, musicals or popular music. We won’t require any amplification on the day. The last thing you want on your day is fussing with the finer details. We can wear full uniform if you are looking for a traditional English country wedding or wear all black for a more contemporary majestic feel. 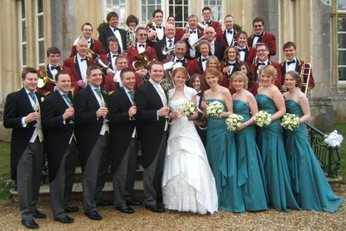 We have experience at both church and civil ceremonies and have performed at a range of venues. Romsey Abbey Clock Barn Whitchurch The Domus Beaulieu Highcliffe Castle Dorset Michelmersh Church and Michelmersh Barns. To make an enquiry today click here!